This book is a comprehensive and thorough logical data recovery guide for beginners in data recovery, as well as a desktop reference for professionals already working in data recovery field. Our data recovery manual provides information about basics of storing and recovering data illustrated by numerous examples. In this data recovery textbook we discuss logical causes of data loss and software data recovery solutions. 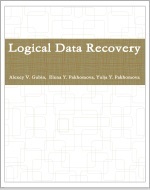 This data recovery book focuses on partition recovery, filesystem recovery, and RAID recovery. Additionally, in the book, you can find exhaustive list of filesystem and partition table structures. Note that the book does not cover mechanical damage and repairs. For the full table of content click here. 5.1.2.2	To image or not to image? 11.2	Can one determine if data recovery was attempted on the storage? The Logical Data Recovery is printed on demand so it would take minimum 8 days to print it and more days (1-2 business days for USA location and 3-4 for Europe) to ship it to your location. When ordering, please provide a correct location to which we will ship the book. Since the book is not a refundable item, before ordering, we strongly recommend you examine more carefully the table of contents listed above and should you have any questions relating to the book send them via the support page.